The topic for my article this week comes from a conversation I had with an Associate Director yesterday at SACAC. He wanted to pick my brain about creating urgency without pressuring his admitted but undecided students. His fear was that he was unintentionally pressuring a lot of those students, and that was having a negative effect on both future conversations (i.e. getting them to answer his calls or respond to his emails) as well as the student’s final decision. Does any of this sound familiar? It’s a common challenge for recruiters, which is why I want to provide you with a couple of things that you can do to correct your approach if you’re dealing with the same thing. First let me touch on what I absolutely don’t recommend you do. Some schools have told me they’ve created “fake” deadlines to speed up a student’s decision-making process. Doing that creates bad pressure that will end up driving some students away from your school completely, or prolonging their decision even further. Instead I want you to talk with the student or family about being a partner in the process. There’s proven strategy and psychology behind that approach. You create the right kind of urgency by setting clear, long-term timeline expectations for a student as early as possible in the process. For example, as you start to have conversations with high school juniors in the coming weeks, I want you to help those students build out the next 6 to 10 months and what that typically looks like for most students. And if your school has specific deadlines that are different than most of your direct competitors, you’ll want to talk about and include those as well. It doesn’t have to be exact, and it’s okay if together you edit that timeline at some point. Just make sure that both you and the student/family are in agreement on the timeline. I would even go so far as to ask them after you build it out if they’re in agreement with everything you’ve discussed. And if you’re near the end of the process and you haven’t built out a timeline with one of your admitted but undecided seniors, I would strongly encourage you do so immediately. You could talk to them about the timeline goals of your office, and ask what they feel they need to do before they’ll be ready to make a final decision. Let me add one more thing. If an undecided senior isn’t willing to build out a timeline with you right now, I would question just how serious they are about your school and ask a few targeted follow-up questions. 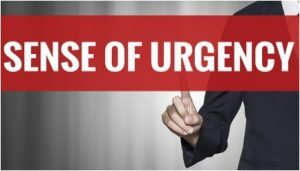 In addition to building out those clear, long-term timelines, here are three other simple things you can do to create the right kind of urgency. Ask them what big question marks still remain. This is particularly useful late in the process with admitted but undecided students. Go ahead and ask the student, or their parents, “What’s making you wonder if our school is the right fit for you?” I’m not about to tell you I know what answer you’re going to get, because the reality is that could go off in a number of different directions. Whatever feedback they give you, analyze it and decide if this is an objection that you need to overcome; the student is simply afraid of making the wrong decision; or the student is just having a hard time telling you “no.” You could also ask something like, “On a scale of 1 to 10 in terms of being close to making a decision, where are you at?” If they tell you they’re at an 8, then get them to tell you concrete reasons around what they need to be at a 9 or a 10. Talk about their next steps and be a problem solver. Building on point #2, take the feedback you receive and come up with a solution for them or at least the next step. You could also tell the student you’re thinking it might be helpful for them to talk to someone who was in the same position recently (i.e. one of your current freshmen) and faced a similar challenge. Ask them if making that connection that would be helpful…most times the answer will be yes. Was this article helpful? I’m always interested in hearing what you think. And, if you have a question about urgency or something else that you’re dealing with right now, let’s start a conversation. Like that Associate Director, all you have to do is ask.